Click arrow and hear the show. ANDREW BASIAGO is a Chrononaut & Mars Transporter Courier. 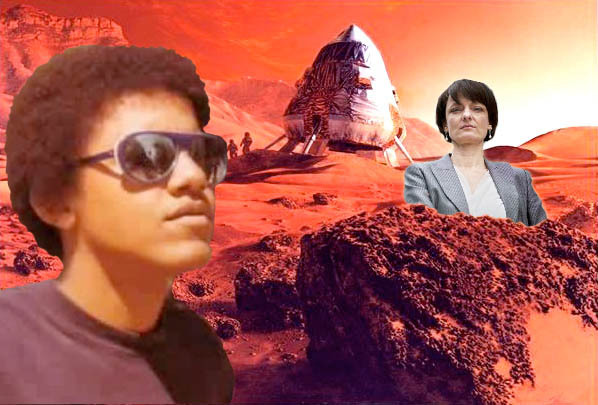 He has been to Mars many times and observed surface water, the several human types as well as animals and plants there. Basiago and Webre outline the history of humans on Mars and detail the several human species that to this day dwell on the Red Planet. They review the documented facts about the Egyptian-Mars Civilization run by cone-headed Pharaohs like Akhenaton. The Mars-Earth civilization was wiped out by Noah’s flood. NAVAL-INTELLIGENCE/CIA RUNS PROGRAMS ON MARS to this day. Basiago documents activities of CIA operatives OBAMA and DUGAN IN THE TRANSPORTER PROGRAM on Mars and the lies committed by Ex-President Obama to falsify his citizenship, Fulbright Scholarship information and connection to an Indonesian cult that considers him a savior. During the solar system catastrophe of 9500 BCE a fragment of the super nova Vela entered our solar system and collided with Mars, making it an oblate planet and destroying its surface ecology and civilization, and collided as well with Earth, destroying our ancient maritime civilization that Plato called Atlantis. Atlantis, Webre says, refers to this entire civilization on Mars, not a single locale. Prior to Noah’s flood, around 10,500B.C., Webre says, Earth and Mars were a single interplanetary pyramidal cultural and society ruled by the predecessors of the Egyptian pharoahs the conehead Anunnaki ETs. That’s why you see frescoes of conehead Egyptian rulers on Mars. On Mars: Egyptian Pharaoh statue NASA denies. Mars and Earth society have been formally separated since then. In January 1901 the Martians sent a 70 minute signal to Earth that was picked up by the Lowell Observatory at Harvard. Nikola TESLA built a Tesla machine in New Mexico in 1902 and began interactive communication with the Martians. All of this was in mainstream press at the time. In the 20s and 30s that Martians organized tours of Mars for Earth elites conducted through the Vatican with pickup destinations at known locations including the southwest USA and Brazil. By 1970, Mars astronauts conducted regular liaison visits to Earth (at a NJ base), where Andy and his father met several Martian astronauts visiting their counterparts in the USA defense establishment. Mars and Earth built a common defense perimeter against an invasion of the solar system by a hyper-dimensional race, possibly the Orion greys and Draco reptilians. A new chapter began with the CIA Mars jump room program in the 1980s, and the executive decision by the USA to covertly colonize Mars in contravention of the 1967 UN Outer Space Treaty.